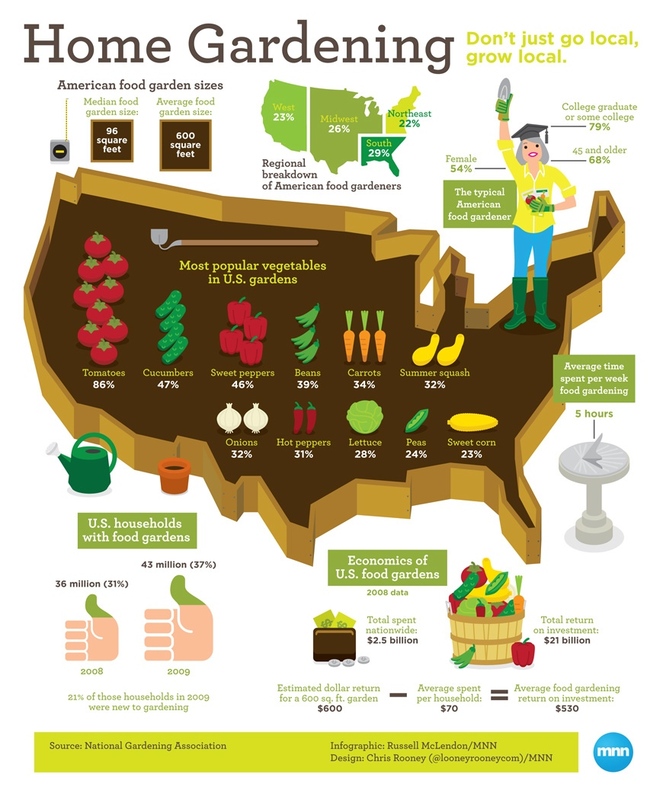 One in three US households are now growing food, according to a special report from the National Gardening Association (NGA).1 This equates to about 42 million households with a food garden in 2013, a 17 percent increase from 2008. The promise of garden-fresh tomatoes, cucumbers, sweet peppers, and carrots is what initially draws many new gardeners in… but what keeps many involved is the intrinsically rewarding feeling of growing your own food. Keep in mind that even if you don’t have space in your backyard for a garden, you can grow vegetables in containers on your patio, balcony, or rooftop. Community gardens are also growing in popularity where you can rent a plot of soil to grow food for your family. If this is your first garden, you might want to start out with just a few options from this list. You’ll probably need to experiment with different methods of planting, watering, building soil health, and controlling pests naturally, but as you gain confidence, and harvest the fruits of your labor, your garden (and your passion for gardening) will likely continue to grow. If you’re not sure of which seeds to choose, check out my Heirloom Seed Kits for wonderful selections of vegetables, fruits, herbs, and flowers that are non-hybrid, non-GMO, non-treated, and non-patented, in selections for both Northern and Southern climates. Growing your own sprouts is quite easy, and you don't need a whole lot of space either; they can even be grown indoors. Sprouts may be small, but they are packed with nutrition, including vitamins, minerals, antioxidants, and enzymes that help protect against free radical damage. Two of my personal favorites are sunflower seed and pea shoots—both of which are typically about 30 times more nutritious than organic vegetables. They're also among the highest in protein. In addition, sunflower seeds contain healthy fats, essential fatty acids, and fiber—all of which are important for optimal health. I used Ball jars when I first started sprouting seeds about 25 years ago, but I've since switched over to growing them in potting soil. With Ball jars you need to rinse them several times a day to prevent mold growth and it is a hassle to have them draining in the sink, taking up space. Moreover, you need dozens of jars to produce the same amount of sprouts as just one flat tray. I didn't have the time or patience for that, and you may not either. The choice is yours though. You can easily grow sprouts and shoots with or without soil. My Sprout Doctor Starter Kit comes with what I consider to be three of the best sprouts to grow – sunflower shoots, broccoli sprouts, and pea shoots. When grown in soil, you can harvest your sprouts in about a week, and a pound of seeds will probably produce over 10 pounds of sprouts. Sunflower shoots will give you the most volume for your effort and, in my opinion, have the best taste. In one 10x10 tray, you can harvest between one and two pounds of sunflower sprouts, which will last you about three days. You can store them in the fridge for about a week. Broccoli sprouts look and taste similar to alfalfa sprouts, which most people like. They're perfect for adding to salads, either in addition to or in lieu of salad greens, and sandwiches and are especially tasty in combination with fresh avocado. You can also add them to your vegetable juice or smoothies. I've partnered with a company in a small town in Vermont that develops, breeds, and grows their own seeds, and is an industry leader in seed safety for sprouts and shoots. All of my seeds are non-GMO, certified organic, and packed with nutrition. My starter kit makes it easy to grow your own sprouts in the comfort of your home, whenever you want. It provides everything you need, so all you have to do is grow and enjoy your sprouts. Early spring is a good time to plant spinach and other loose-leaf greens. The harvest is ready in just three to five weeks; simply cut off leaves here and there with scissors (don’t worry, they’ll grow back). Up to half of the nutrients in lettuce may be lost within two days of harvest, so growing your owns leads to a much more nutritious salad. One cup of kale contains just around 30 calories but will provide you with seven times the daily recommended amount of vitamin K1, twice the amount of vitamin A and a day's worth of vitamin C, plus antioxidants, minerals, and much more. This leafy green also has anti-inflammatory properties that may help prevent arthritis, heart disease, and autoimmune diseases – plant-based omega-3 fats for building cell membranes, cancer-fighting sulforaphane, and indole-3-carbinol, and an impressive number of beneficial flavonoids. Kale grows all season long, but its flavor gets sweeter after a frost. Impressively, kale can survive temperatures as low as 10° Fahrenheit, so be sure to keep it growing into the fall and winter. Kale is ready to harvest about a month after planting. Chard belongs to the chenopod food family, along with beets and spinach. It’s an excellent source of vitamins C, E, and A (in the form of beta-carotene) along with the minerals manganese and zinc. It’s a hearty plant that grows easily, and it makes a striking addition to your garden with its bright red stems. Plus, chard degrades quickly during shipping, making it ideal to grow at home. Plant chard in early spring, and you’ll be able to harvest it all season long. Bok choy can be planted early spring through midsummer. Its leaves can be harvested when they’re about three inches tall, or you can wait until a head forms and harvest the whole plant at once. Fresh herbs can make your meals pop, but they’re expensive to purchase in the store. Fortunately, it takes very little space or skill to grow your own. You can even grow them on a windowsill. Some basic herbs to start with include basil, chives, cilantro, parsley, thyme, and dill. While regular tomatoes are relatively easy to grow, they can be sensitive to different temperatures. Cherry tomatoes are even easier, and you’ll be rewarded with pint after pint of the fruits that taste far superior to store-bought versions (plus they’ll be free of pesticides and fertilizers). Cherry tomatoes like a sunny spot to grow, and you’ll need to tie them to a supportive stick or tomato cage as they grow. Cucumbers grow quickly and easily, and once you taste your homegrown version, you won’t want to go back to store-bought. These vines like to climb, so plant them near a trellis or fence, and put the seeds in only after the soil is warm. Snap peas are another “vertical” grower, making them ideal when space is tight. Plant peas in early spring and plan to tie them to a small trellis for support when they start to get tall. Edible flowers like nasturtium add color to your garden and can add intense flavor to your meals. Plus, nasturtium is known to naturally repel pests like whiteflies, squash bugs, and striped pumpkin beetles. It takes about one to two weeks from planting for flowers to develop (simply snip the petals off for eating). These can even be grown indoors in pots. The key to growing nutrient-dense food is to have soil that is abundant with microbial life and nutrients. Sadly, very few of us have access to this type of soil, but the good news is that it is relatively easy to create it. Paul Gautschi has been a personal inspiration to me in this area, and his garden is a testament to the fact that growing large amounts of healthy food can be very simple, and doesn’t require a lot of time. The documentary Back to Eden was my first exposure to his work. I struggled for years seeking to unlock the puzzle of growing nutrient-dense food before I came across his recommendations—the simplicity and low cost of which really appealed to me. After studying his technique more carefully, I realized that using wood chips is probably the single best way to optimize soil microbiology with very little effort. You can actually use virtually any organic material for mulch but wood chips seem to be one of the best, as they are concentrated sources of carbon that serve to feed the complex soil ecology. Typically, carbon is one of the nutrients that is far too low in the soil. Additionally, by covering the soil around your plants and/or trees with mulch, you mimic what nature does naturally, and in so doing, you effortlessly maximize the health of the soil. Actually, the effortlessness comes after you do the hard work of moving the chips to where you need them to be. But once there, over time they work their magic and virtually eliminate the most concerning garden tasks, which is weeding, watering, and fertilizing. Biochar is another great tool to help building your soil, the surface area of biochar is what gives it such great qualities when used in farming or gardening. The chips and leaves gradually break down and are digested and redigested by a wide variety of bacteria, fungi, and nematodes in the soil. Once the carbon can’t be digested anymore, it forms humates that last in the soil and provide a host of benefits that I will describe below. Other gardeners till the wood chips into the ground, which is by far your worst option. It’s actually important to avoid tilling the earth as it tends to destroy soil microbes, especially the complex and delicate mycorrhizal fungi. When you use wood chips as ground cover, tilling becomes completely unnecessary. A few short months after putting down a deep layer of wood chips, you will end up with lush fertile soil beneath the chips that will happily support whatever you choose to grow. It is important to never plant in the actual chips, you need to move the chips back and plant in the soil and then cover the plant to below the first leaves. One major reason why most people don’t want to garden is they abhor weeding. Wood chips will radically reduce your weeding, probably by over 90 percent, and the weeds that do grow are easily pulled out by their roots so it becomes relatively effortless to keep the area clean. Many parts of the country are also challenged with droughts and may not get more than 10-20 inches of water a year. Wood chips are the ideal solution, as they will eliminate water evaporation from the soil. Better yet, at night they will grab moisture from the air and release it into the soil in the day when the soil needs it. Gardening can provide you with a variety of fruits and vegetables to feed your family, but it also gets you outdoors in the fresh air and sunshine, helping your body produce much-needed vitamin D. It gets you moving, providing important exercise, and allows you to connect socially with other gardeners. It’s also good for your mental health. Researchers in the Netherlands have also found that gardening is one of the most potent stress-relieving activities there is.6 In their trial, two groups of people were asked to complete a stressful task; one group was then instructed to garden for half an hour while the other group was asked to read indoors for the same length of time. Afterward, the gardening group reported a greater improvement in mood. Tests also revealed they had lower levels of the stress hormone cortisol compared to those who tried to relax by quiet reading.